A video of two Everton fans singing a crowd pleasing rendition of ‘The Whole Of The Moon’ has gone viral on Twitter. 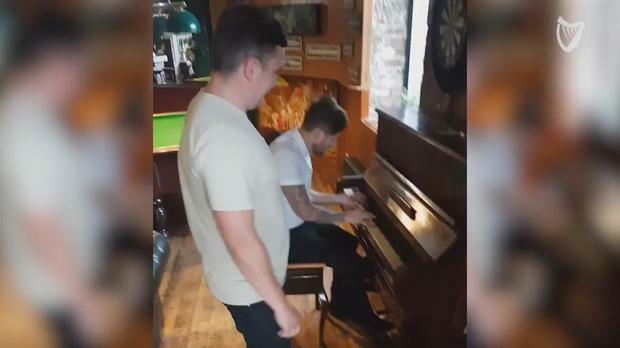 Adam Cafferty and Michael Bourke stunned crowds recently while hanging out in the pub for their pal Jimmy Murphy’s stag do. Known as The Acoustic Odds, the duo performed The Waterboys hit song for a crowd of party-goers when they spotted a piano. Everton goalkeeper Jordan Pickford gave the video the seal of approval after tagging his pals in the video comments. Waterboys star Mike Scott described the rendition as “magnificent”.